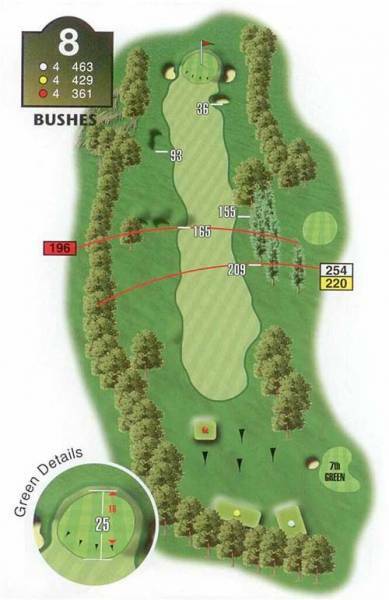 "This will test your skills and patience - the longest par 4 on the course that challenges your tee shot. Anyone hitting the ball right to left will certainly finish in the left-hand rough. The advanced player should attempt a 'power fade' allowing the ball to scuttle off the down slope and up the fairway. "Making the green in regulation requires a high soft landing shot into a small false fronted green. Anyone hitting low will have to negotiate the cross furrows, making this type of approach unpredicatable. The rise up the green regularly bewilders players who then require short game skills to recover their misjudgement. Subtle swings on the green complete the test as this difficult hole justifies its position as stroke index 1."